Do you need a Coronado professional bee removal service? You’ve come to the right spot. That’s what we do at D-Tek Live Bee Removal. We specialize in the safe and humane removal of honey bees from your Coronado home or business. We utilize a custom built live bee removal vacuum system to gently remove the bees. We then transfer the honey bees into a beehive box. From there we drop the honey bees off to our own San Diego County beekeeping farm. D-Tek Live Bee Removal offers free estimates and inspections for your Coronado bee problem. Call today! 760-224-3040. Rapid same day service is usually available. All of the above steps in the live bee removal process are very important. There are two that stand above the rest in importance. The first is the complete removal of all beehive and honeycomb. This is extremely important for a few reasons. 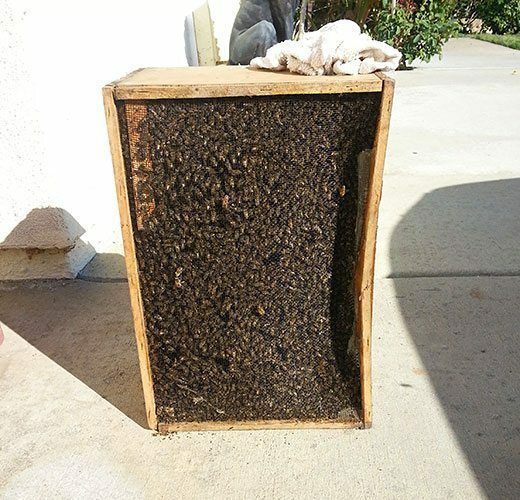 After the honey bees have been removed and are no longer around to tend the beehive more often than not the honey will melt out and can cause damage to your Coronado home or business. The honey can cause stains on drywall, stucco, and siding. It can also damage electrical wiring, wood framing, and molding/millwork. Leaving a beehive in a structure will also cause other common household pests to show up wanting a quick snack. These can include but are not limited to ants, mice, rats. Leaving a bee hive in the structure of your Coronado home or business will also lead to recurring bee problems. Honey bees have an excellent sense of smell. Even after the initial honey bees are removed other bee swarms in the area will be able to smell the honey comb that was left behind. There can be anywhere from 20-100 active bee hives per square mile so the chances of honey bees smelling a left over hive in a structure is a sure thing. More often than not honey bees will infest the same area again and again until the honey comb is properly removed. The second very important step is the repair work to the structure. The most common spots for honey bees to colonize is attics, walls, and floors. When a bee hive is built in areas such as these it is often times necessary to cut into the roof, stucco, siding, drywall, or floor to fully remove all of the bee hive. We understand it can make clients nervous when we say that cutting into a roof, siding, stucco, or floor is necessary. D-Tek Live Bee Removal includes in every price all repair work that may be needed to your Coronado home or business. We offer guarantees in writing that all repair work will be leak free and defect free. We are also fully insured. We perform over a thousand bee removal repairs each year in San Diego County without any incidents or call backs. After the bee hive removal has been completed and all associated repair work finished it is time to make sure the honey bees can’t infest the same area again by bee proofing the area. We also refer to this as our bee control service. What this entails is sealing up every crack, crevice, vent, or hole in a 10 foot radius from the original entry and exit point of the bee hive. This 10 foot area is covered under a written guarantee that the honey bees will not return. When performing our bee control services in Coronado our technicians have to think like a honey bee. We must be very thorough by sealing every vent, crack, crevice, and hole as tightly as possible. All whole home or business bee control services include a written guarantee that the honey bees will not return. Most of the San Diego County bee population are European honey bees. However from time to time we do encounter Africanized honey bees in San Diego. Africanized honey bees are much less picky with where they build a bee hive. We more commonly find Africanized honey bees in places that are lower to the ground. Irrigation boxes, bird houses, and air conditioning units are common places you may find the Africanized honey bees. We have our own San Diego bee farm that we drop the honey bees off to. We are professional beekeepers who have a great relationship with bees. Our apiary has 45 plus well maintained hives that are used to pollinate nearby orchards and fields. We then harvest raw honey, pollen and beeswax from our hives that we offer to the public. Are you a farmer looking to purchase or rent a bee hive? We have beehives for sale or rent for pollination services. If you want your bee removal taken care of quickly and by experts give D-Tek Live Bee Removal a call today! Our direct line is 760-224-3040. If we are not able to answer the phone simply leave a message with your name and phone number. We will call you back ASAP. Usually within 30 minutes. Don’t feel like calling? Use our bee removal contact form on this website instead. Please leave your name, number, email address and a short description of where the honey bees are located at on your Coronado home or business. We will be in contact with you shortly regarding your bee problem.